Originally from St. Louis, MO, Kelly recently returned to the US after a long stay abroad, where she studied German and English Literature. 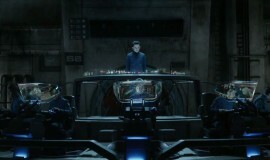 Ender’s Game was first recommended to her by a member of her theater troupe when she was just a freshman in high school. Now 27 years old, she’s been a devoted contributor and editor for various internet sites for the past 10 years, and it was her passion for the book and upcoming movie which led her to found EnderNews.com in early 2012. A fan of musical theater, red wine, and bonfires, she is especially fond of the moments when those things beautifully combine. A 33 year-old wife and mother to two, Crystal currently lives in Honolulu, Hawaii. She is the co-author of the bento cookbook Yum-Yum Bento Box: Fresh Recipes for Adorable Lunches and the author of numerous blogs including Adventures in Bentomaking, Fictional Food, and her Ender’s Game fansite EnderWiggin.net. She first read Ender’s Game in the sixth grade back in the early 1990s and has been waiting for a film adaptation ever since. She has an unhealthy obsession with the Japanese cult character Domokun.